In April last year, we visited Belgium and France, Belgium for the fries and France for the champagne! Our Belgium visit brought us for a couple of days to Namur, the regional capitol of Wallonia, located on a great confluence of the Meuse River, the world’s oldest river, that winds up from France through Belgium fried potato country to the North Sea. We stayed for a few nights at a novel hotel/spa called the Nest, located in a fine residential neighborhood atop the Citadel, the winding protective precipice above the city and river. It has been cleverly reconstructed from some ancient stone farm dwellings, and contains a handful of suites surrounding a beautiful pool and spa. 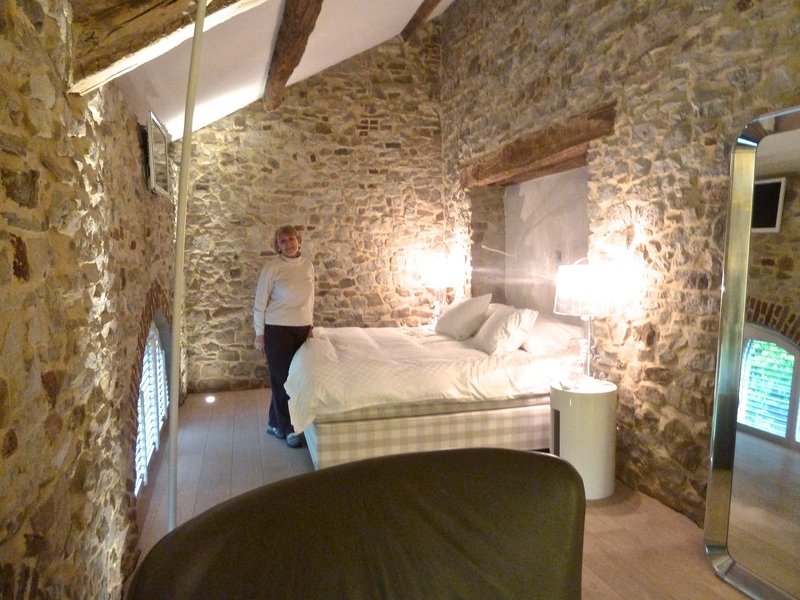 The White Suite, where we stayed, was set up like a small deluxe modern apartment, with ancient stone inner walls and modern white furniture. The bedroom, which contained a lounge area and fireplace had a hand-made Swedish bed, called a Hastens, which cost three or four times what the most expensive beds we had known, and was put in the year before for the historic visit to Namur of Prince Albert of Monoco, as the news item below outlines. NAMUR, BELGIUM – JANUARY 31: Prince Albert II of Monaco attends the 1st Interdisciplanary Congress On Sustainable Development at the Palais des Congres on January 31, 2013 in Namur, Belgium. Topics expected to be covered at the two-day conference, on January 31 and February 1, 2013, include food and agriculture, land use, planning and housing. My grandfather Ed and I, exhausted and stiff from the cold, walked back to the friend’s house and we returned to his house to thaw out and celebrate the coming of 1968. I shall never forget that days frozen walk into football history. Thanks to my grandfather and that legendary game, my tickets (then his, same seats) to today’s game, being called Ice Bowl II, sold for a thousand dollars online, and Vicki and I will be cheering on the Packers on our new widescreen TV next to our roaring fire in the hearth of our cozy Lake Geneva home.